If your future includes a move to Ventura, check out Meathead Movers! Our professionally trained student-athlete movers, moving concierge, and princess packers are prepared to get you safely moved into your new Ventura home. 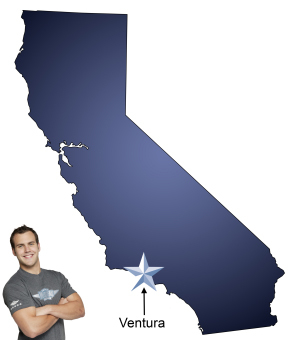 When you make your move to Ventura, be sure to contact Meathead Movers. No matter what type of moving service you need, our student-athlete movers are ready to handle all your moving needs. People have been flocking to Ventura ever since Mission San Buenaventura was founded by Father Junipero Serra in 1782. The area’s sun-kissed Mediterranean climate, easy access to the vast Pacific Ocean and small-town feel have made it a destination for many looking for the quintessential laid-back California vibe. If you’re relocating to Ventura or are already here and merely moving to a new neighborhood, Meathead Movers is the right choice. Our professionally screened and trained student athletes from local schools such as Ventura College can help make your move a hassle-free, no-drama experience. Ventura calls itself “The Real California”, and this charming coastal community more than lives up to that claim. Surfers flock to Rincon, known as one of the top surfing spots in the world. But locals know that great waves are to be found at dozens of breaks along the coast from Mussel Shoals to the Los Angeles County line. Scuba divers, kayakers and hikers find plenty of adventure at the Channel Islands, a chain of eight rugged islands off the coast known as the “American Galapagos.” A great starting point for adventure is the Channel Islands National Park Visitors Center. The city’s rich soil combined with its delightful climate allows for citrus to grow here better than just about anywhere else in California. Sun Kist, the world’s oldest agricultural co-operative, was formed here in the late 19th century. This lovely climate has drawn many to this quaint-yet-vibrant Southern California city. From the ocean views of Ventura Beach Keys (recently named one of the most livable communities in America) to the Spanish architecture of Midtown to the hillsides of Clearpoint and Ondulando, you are sure to find your perfect home here. If your family is lucky enough to get to relocate here, Meathead Movers is a hassle-free, cost-efficient choice. Our moving company specializes in local, long-distance, and commercial moves. We also provide reliable packing, storage, on-site relocations, and our distinctive moving concierge service, which connects you with local service providers to make your transition as easy as possible. Our well trained and motivated student athlete movers will make your move as smooth and efficient as possible. We pride ourselves on providing you and your family with the best service possible, and it can be seen in our breakage-to-move ratio which is eight times less than the national moving industry standard. You can rest assured, knowing that Meathead Movers will give you the best service in the industry. Contact us today for a free move estimate. With our 100% satisfaction guarantee and A+ rating with the Better Business Bureau, the only thing you have to lose is the stress that comes from moving! Moving to Ventura? Here are some helpful resources.